This has been a long, long time coming and I am beyond excited to start developing and organizing the return of my outdoor guided hikes for the 2015 season. I have directed more outdoor public nature walks over the last 6 or 7 years than than I can remember, both on my own or affiliated with research institutions such as the Royal Botanical Gardens in Burlington or non-for-profit organizations including the Burlington Green Youth Network, Earth Day Hamilton and Halton Conservation Authority. It all began with the highly informal tree identification hikes that I conducted in high school that were almost exclusively attended by just my closest friends. 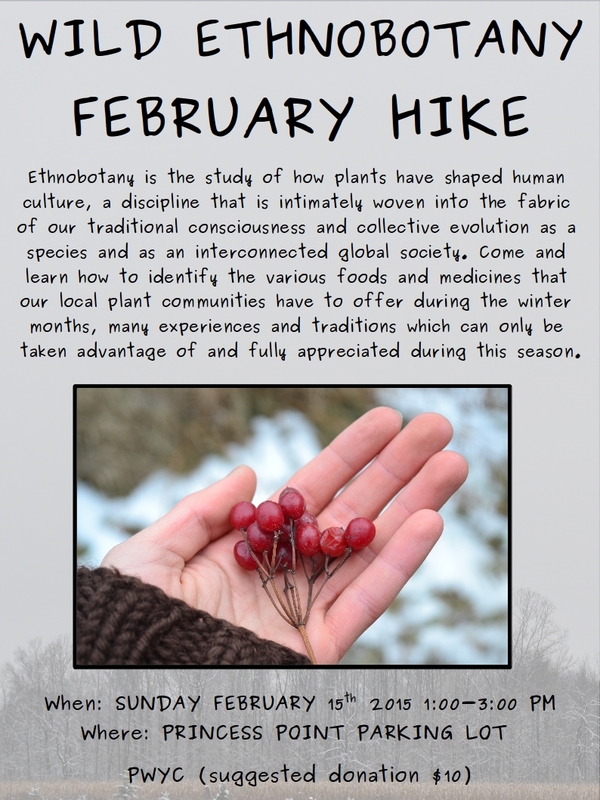 This time around I want to make the program accessible to everyone and much more consistent, operating each ‘Wild Ethnobotany’ event on a regular monthly basis that has been throughly planned and most importantly, adequately advertised. (Feel free to spread the word to family and friends please and thank you!) More often than not, these hikes will be held in and around the Hamilton area. Although reading about plants from trusted resources is an excellent introduction to the world of botany, experiencing plants as the creatures that they are in their natural context and in person is crucial to learning to distinguish them from any potentially poisonous or otherwise dangerous look-alikes and to grasp the physical changes that one species undergoes throughout the growing season as it matures, flowers and sets seed. Many plants have a variety of different uses that are only available at certain times of the year, so learning to recognize the changes that the same species undergoes as the seasons progress is essential to developing a well rounded understanding of the target species and it’s relative behavior. A suggested donation of $10 to help cover the costs associated with advertising and preparation for this hike would be greatly appreciated but no one interested in learning will be turned down due to a lack of funds. Since we will be walking around outside for 1.5 – 2 hours in February I recommend wearing appropriately warm clothing, bringing along a nice hot beverage, some snacks if you feel inclined and suitable footwear as the trails may be icy or snow covered depending on the weather leading up to the event. Speaking of which, If the weather happens to be uncooperative (heavy snowfall, blizzard, extreme cold etc.) as it sometimes is for a group of people to be standing outside exposed to the elements, I will notify everyone who has RSVP’d me by e-mail or has signed up as ‘Attending’ or ‘Maybe’ in the Facebook event page of a suitable alternate day. If you would like to know something else (anything at all) before the workshop date or to RSVP then please send an a message to tomnagy@outsidethehops.com.